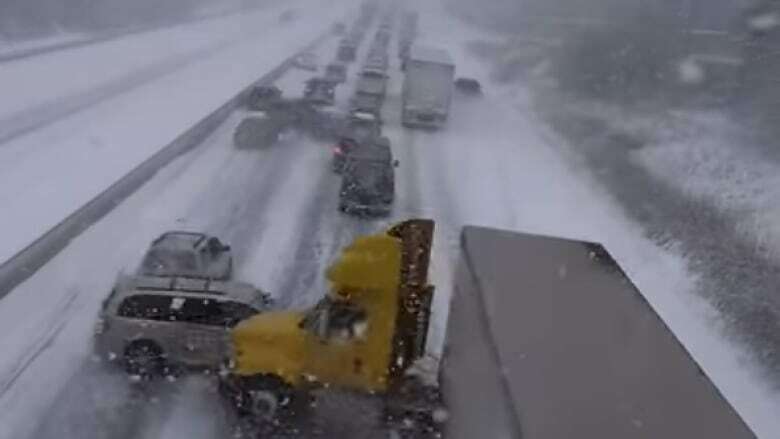 Ontario Provincial Police are reminding drivers to slow down or risk another pileup like the one caught on film Saturday near Bowmanville, Ont. There's a travel weather advisory in effect today for the Highway 401 corridor between Oshawa and Belleville, Ont. — the stretch that saw a string of crashes involving about 100 vehicles on Saturday, all of which were caught on camera. Ontario Provincial Police are reminding drivers that a similar scene could happen this week if people don't slow down. Speed was a factor in "virtually every crash" the OPP investigated, Sgt. Kerry Schmidt said, with drivers admitting to going 80 kilometres an hour in whiteout conditions. "That is way too fast," Schmidt said, adding 10 to 20 kilometres an hour is a safer bet. YouTube users have been posting clips of the crashes near Bowmanville on Saturday. One video, posted by Aaron Conlin, shows crashes occurring one by one behind a block of stopped traffic. "Oh, here we go, here we go!" says a voice in the video at the 1:30 mark, before cars start colliding and a tractor-trailer jackknifes into numerous vehicles. In another video posted by Willie Woo, an ambulance is on scene and paramedics are pushing a stretcher out to the crash site. OPP told CBC News no serious injuries were reported, but multiple people were taken to hospital. A travel weather advisory was also in place at the time of the crashes, cautioning drivers to prepare for slippery roads and reduced visibility.